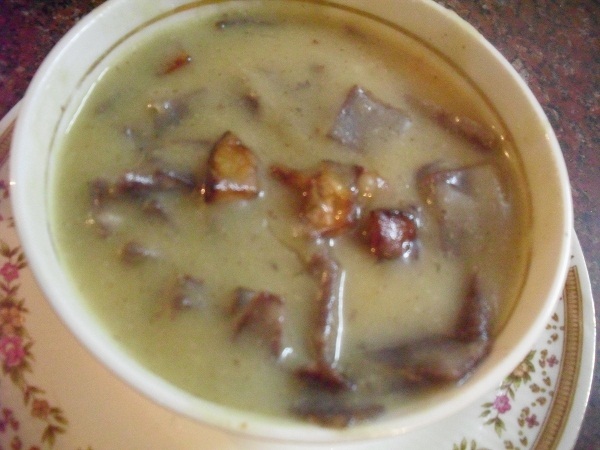 Godumai Pittu is a traditional dish of Tamil Nadu prepared as the evening prasaadam during Navaraatri. Fridays which fall within the nine days of Navaraatri are very auspicious days. Elaborate poojaas are performed in the mornings.Women are invited for the pooja and they are considered as the Goddess personified and worshipped accordingly.They are treated with a grand traditional feast and are gifted with sarees and cosmetics. 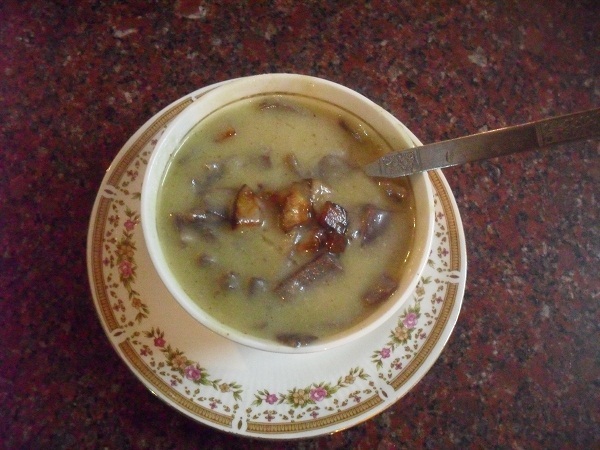 Sakkarai Pongal and aama vadais are traditional offerings made to the Goddess and served during lunch. It is customary to prepare Pittu on Fridays as the evening prasaadam. 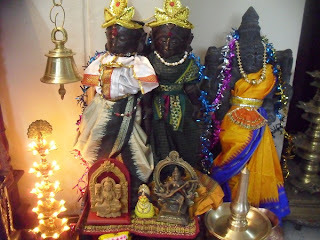 THESE DOLLS ARE FROM TIRUPATI AND THEY ARE CALLED MARAPAACHIS. 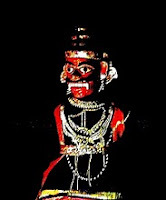 THE AUTHENTIC MARAPAACHIS ARE MADE OF RED SANDAL WOOD KNOWN AS RAKTA CHANDANA IN SANSKRIT. THE WOOD HAS GREAT MEDICINAL VALUE .THE RED SANDAL WOOD PASTE IS GOOD FOR SKIN AND IT HEALS PIMPLES, RASHES AND BOILS. EVERY BRIDE IS PRESENTED WITH A PAIR OF MARAPAACHIS BY HER PARENTS DURING THE WEDDING. 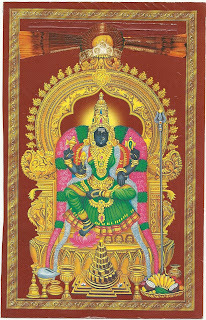 MARAPAACHIS COMMAND A PROMINENT POSITION AS THE RAAJA AND RAANI IN THE NAVARAATRI KOLU. 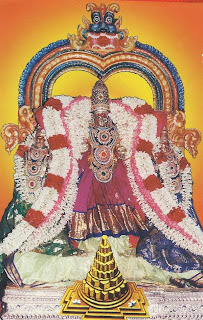 THE SCULPTURE BESIDE THE MARAPAACHIS IS THAT OF GODDESS ANNAPOORNESWARI. SHE IS DECKED UP IN FINERY FOR THE NAVARAATRI OCCASSION. 1. Dry roast broken wheat till the colour turns red. 2. Cool the roasted broken wheat and dry grind until the texture resembles fine sand,and spread it out in a deep plate ( taambaalam ). 3. Add salt and turmeric powder to one cup of boiling water. 4. Sprinkle the water table spoon by table spoon and moisten the flour evenly using your palms. 5. A fistful of moist flour when pressed between your palm and your fingers should acquire and hold the same shape and crumble as soon as you release your hold. Stop adding water at this stage. 6. Bundle up the moist flour in a cloth, and steam it using any steaming unit for ten minutes covering the bundle with a lid. 7. Transfer the steamed flour to the plate and spread it out so that it cools down. Crumble the lumps if any. 8. Heat half a tbsp of ghee and roast the cashew nuts and keep aside. 9. 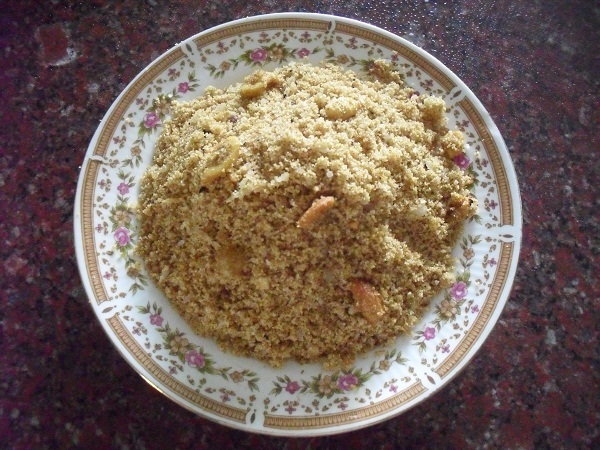 In the same pan roast the fresh coconut gratings to a golden brown colour and keep aside. 10. Add one cup of water to the sugar and boil it till you get a syrup of two thread consistency. 11. 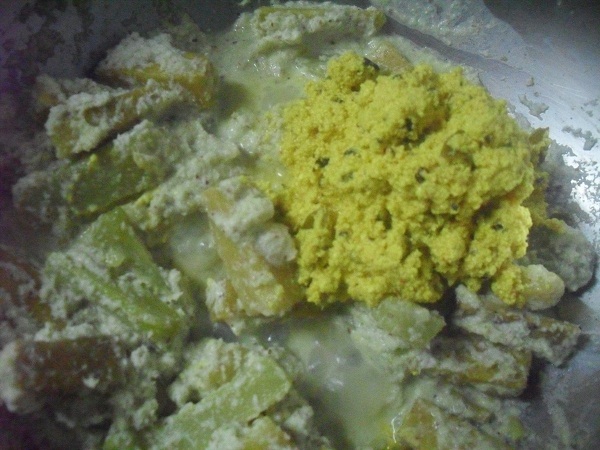 When the sugar syrup starts frothing add one table spoon of ghee and switch off flame. 12. 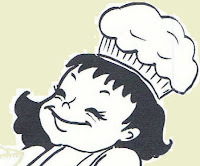 Gently pour the thick syrup all over the flour and quickly rub and mix them together using the back of a ladle. 13. Do not worry if you end up with crystallized sugar slabs after all the effort. Allow the mixture to cool. Dump the whole mixture in a mixer and give it a quick swish to blend the crystallized sugar and the wheat flour together.Transfer it to a plate. 14. 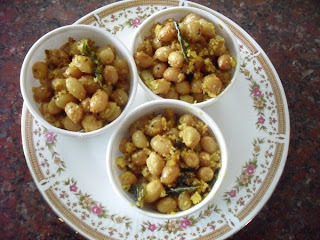 Add the roasted cashew nuts, roasted coconut gratings, cardamom powder and the remaining ghee and blend well. 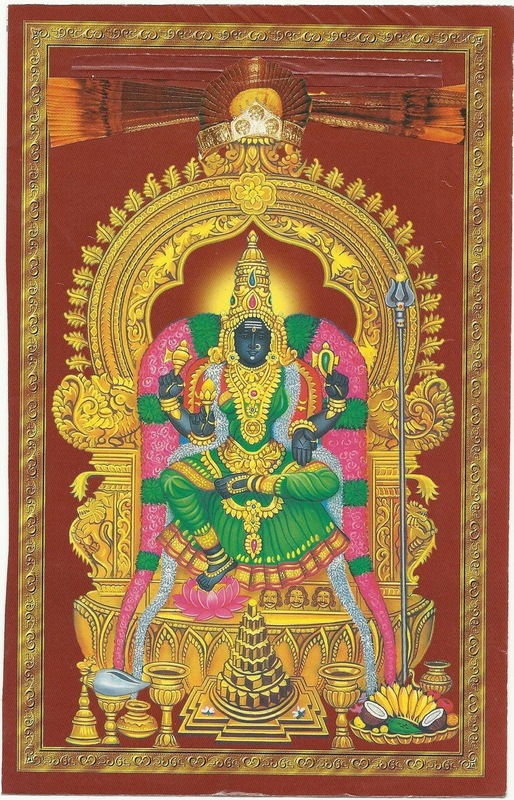 Offer the Friday special Godumai Pittu to Mother Goddess and give away the delicious prasaadam packed in small packets to one and all who visit your Kolu. 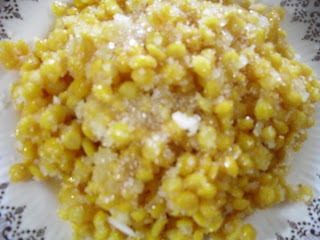 This is another sweet sundal prepared using jaggery. The addition of salt and chillies enhance the taste of this sweet sundal and it is a welcome change after all the salty and lemony sundals. THIS IS A GLASS PAINTING OF GODDESS LAKSHMI IN THE DOME OF THE BAND STAND IN A PARK AT MYSORE.THANKS TO GUHAN FOR THE PHOTO. THE LIFE SIZE WOODEN DOLLS DRESSED UP AS A COUPLE ARE CALLED NALAGOWRIS.THEY HAVE FLEXIBLE JOINTS AND DETACHABLE BODY PARTS.THEY CAN BE DRESSED UP AND ARRANGED IN ANY POSTURE.THANKS TO SAVITHRI AND PRANAV FOR THE PICTURE. 1. Dry roast green gram till it gives out a pleasant aroma. 2. 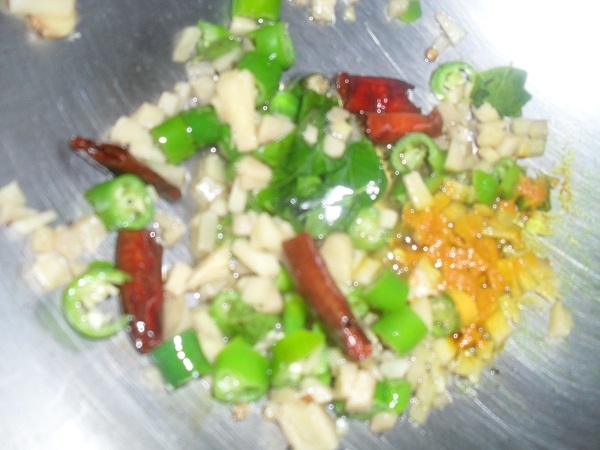 Switch off flame, add water and soak the green gram for half an hour. 3. Wash the soaked green gram, add fresh water and boil it. 4. Pinch one grain to check if it is cooked. 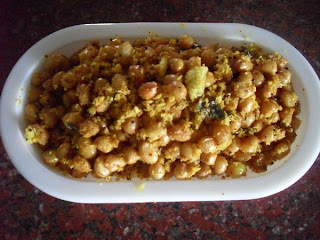 The green gram should be soft enough to break easily, but it should not become mushy. 5. Add salt and boil for two more minutes and drain. 7. 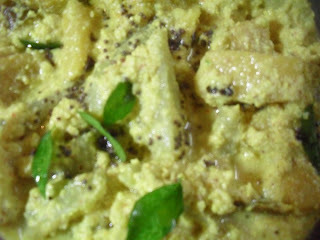 When the mustard seeds splutter add the broken red chillies, curry leaves and then the cooked and drained green gram. 8. 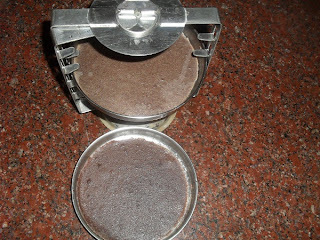 Add powdered jaggery and blend well on low flame. 9. 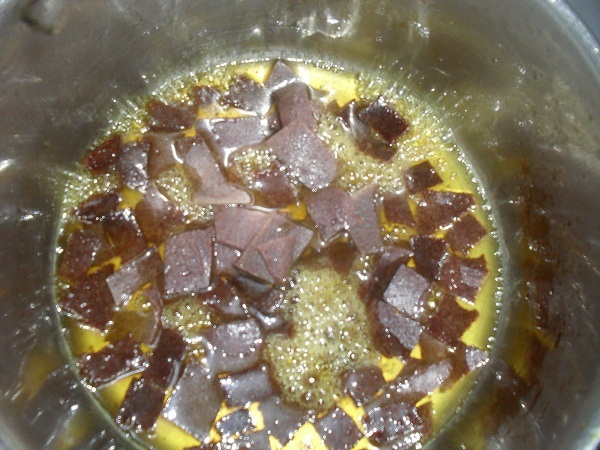 Allow the jaggery to melt and stir for two more minutes. Offer the healthy and delicious Pachai Payaru Vella Sundal to the Goddess and share it with the visitors. Kosambari is a traditional side dish prepared during all the feasts in South India and it occupies its own specific space on the banana leaf. 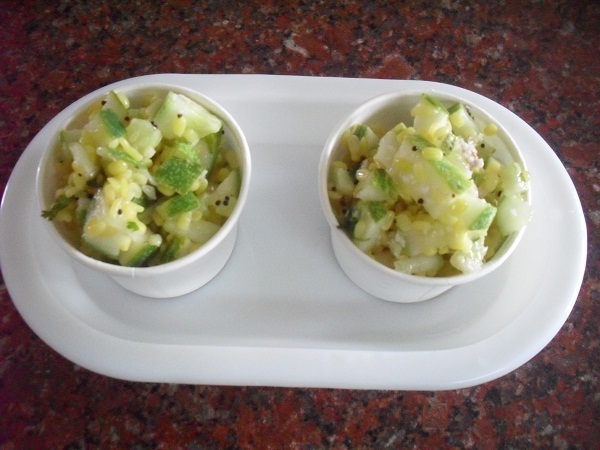 It is one of the easiest , quickest and tasty Prasaadams served in leaf cups during Navaraatri. THIS IS A GLASS PAINTING OF PAARVATHI IN THE DOME OF THE BAND STAND IN A PARK AT MYSORE. THE GRANDEUR OF THE MYSORE PALACE ILLUMINATED FOR DASARA. BOTH THE PHOTOS ARE CLICKED BY GUHAN. 1. Wash and soak green gram dal for half an hour. 2. Thoroughly wash and chop the cucumbers along with the green peel and let it stand for fifteen minutes . 3. Heat oil and add the mustard seeds. 4. 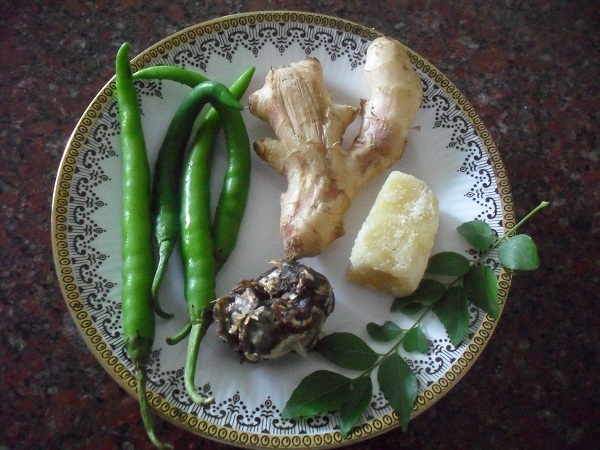 When the mustard splutters add the asafoetida and then the green chillies and the curry leaves. 5. Add the soaked and drained green gram dal and saute till dry. 6. Squeeze out the water from the cucumber and add the vegetable to the dal. 7. Quickly saute for a few more seconds till dry and switch off flame. 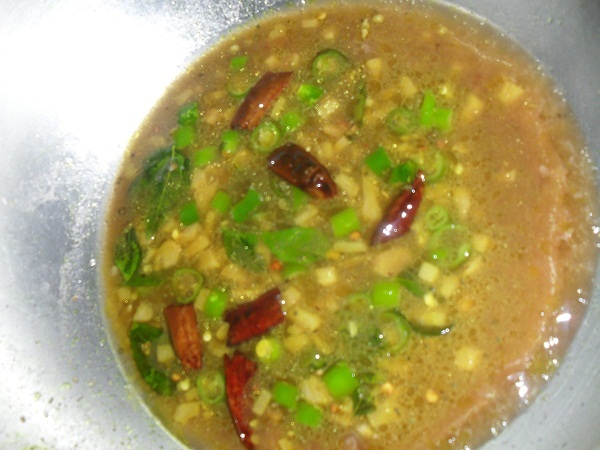 Neither the dal nor the cucumber should be cooked. Sauteing is done only to remove moisture. 8. Dissolve salt in the lime juice and mix with the dal and cucumber mixture. 9. 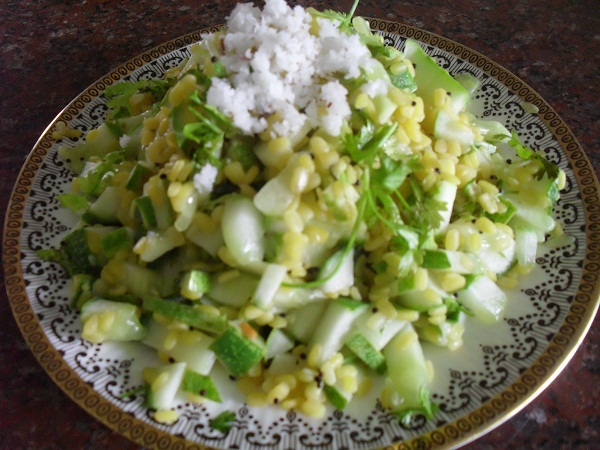 Garnish with chopped coriander leaves and fresh coconut gratings. Offer to Shakti and then relish the prasaadam with all the invitees. Navaraatri is the time when the primordial female energy - Shakti - is celebrated with great devotional fervour through out India. 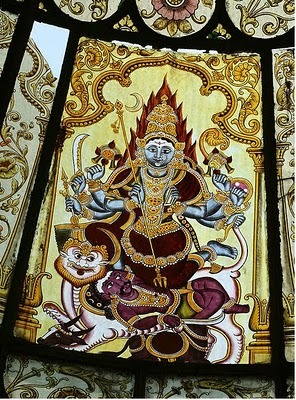 THIS IS A GLASS PAINTING OF GODDESS CHAMUNDESWARI DECORATING THE DOME OF THE BAND STAND IN A PARK AT MYSORE. THANK YOU GUHAN FOR THE BEAUTIFUL CLICK. 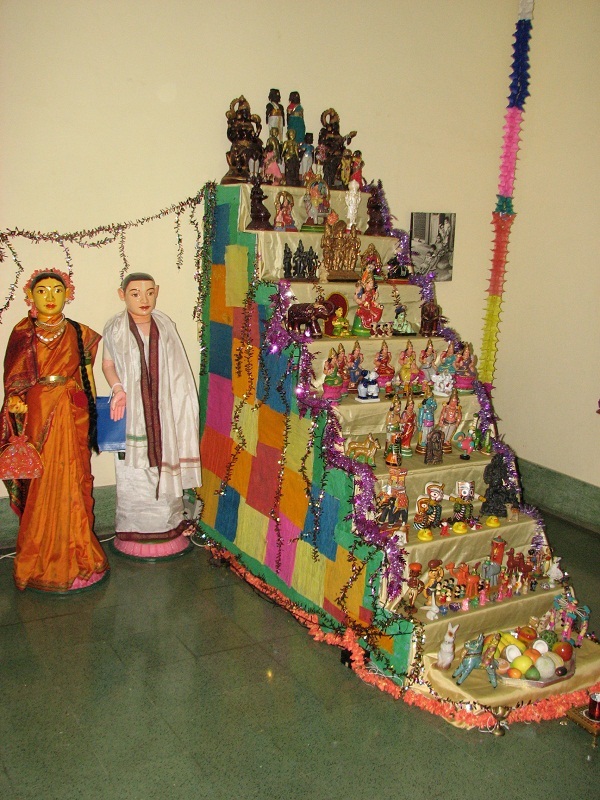 All the creations of Devi are represented by clay dolls and are arranged on decorative steps constructed for the purpose. This display of dolls during Navaraatri or Dasara is known as Kolu in Tamil and Bombe kooriso habba in Kannada . 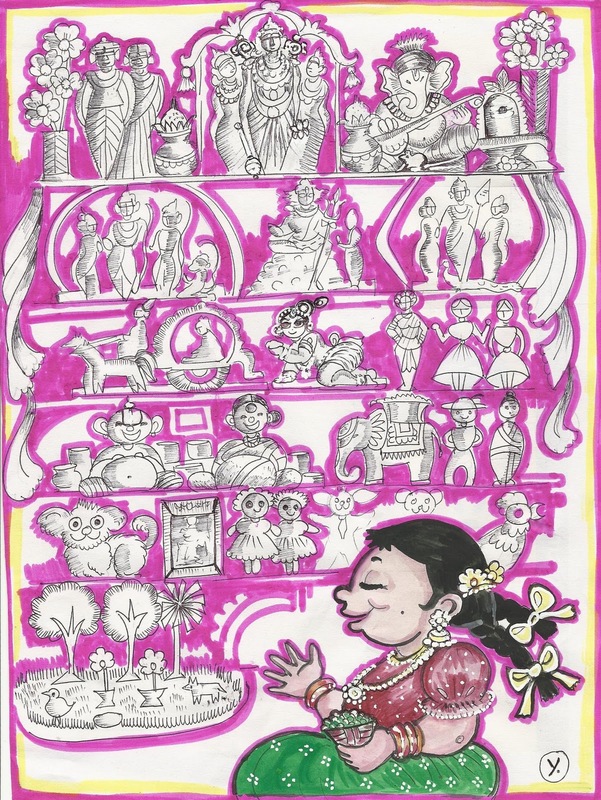 THE LOVELY SKETCH OF NAVARAATRI KOLU IS SPECIALLY CREATED BY YOSEE FOR THIS POST.THANK YOU YOSEE. Women and girl children are considered as personifications of Mother Goddess. They are revered and treated with a grand feast and taamboolam is offered to them. Devi , Durga or Shakti is worshiped in the mornings on all the nine days. 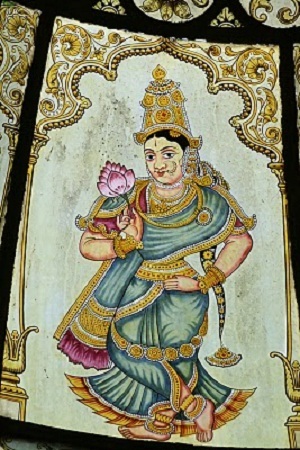 An auspious bath is given to the Goddess and She is anointed with sandal paste.She is then decked up with new clothes, garlands of flowers and ornaments. Flowers and vermilion are offered ( Archana) while chanting Her one thousand and eight names. Variety rice dishes like pongal, lime rice,tamarind rice and curd rice, lentil fritters (aama vadai) , and porridge ( paayasam ) are offered to her along with fruits, coconut and betel leaves and areca nuts. Finally lamps with wicks dipped in ghee ( Aarati ) are waved in front of her and the pooja is completed. Evening times are more for social and cultural activities. 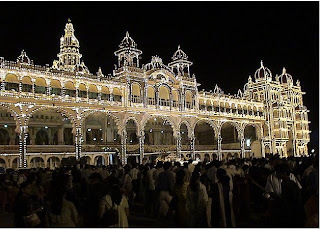 Friends and relatives are invited for the evening Aarati. A little before 6 P.M. lamps are lit and sweet and savoury snacks are offered to Mother Goddess. The ladies sing and dance in praise of Devi and finally aarati is waved in front of Her. Men and little boys are also treated with light refreshments. The women and girls considered as The Devi , are presented with a tray of Taamboolam consisting of betel leaves, areca nuts, a coconut, a small box of vermilion,a small packet of turmeric powder or turmeric sticks, a string of flowers, a small mirror, a comb, glass bangles and a blouse piece, which are considered as symbols of auspiciousness. The evening prasaadam is given to them in leaf cups ( donnais ) or paper cups along with the Taamboolam. 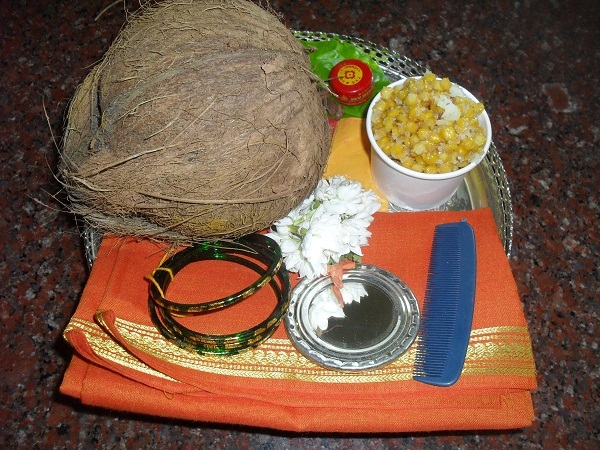 Here are a few ideas for the Navaraatri Giveaway Prasaadams starting with Sihi Kosambari. 1.Dry roast bengal gram dal on low flame till it gives out a pleasant aroma. 2. Switch off flame and add 4 cups of water and allow the roasted dal to soak in it for half an hour. 3. 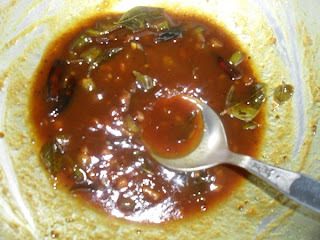 After half an hour switch on flame and cook the dal in the same water adding the salt till it becomes soft but not mushy. 4. Drain the dal and keep aside. 5. 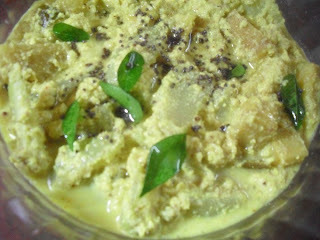 Heat ghee in a pan and add the cooked and drained dal and saute till dry. 6. Add 3 tbsps of sugar and stir till it melts and becomes dry again. 7. Allow to cool and then mix in the remaining sugar and cardamom powder. 8.Garnish with fresh coconut gratings. Offer the delicious Sihi Kosambari to Mother Goddess and distribute it to all those who visit your Kolu. 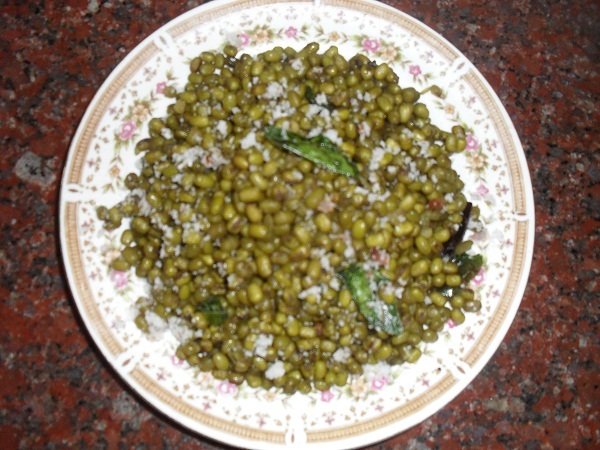 Puli Inji is one of the relishes served in the great Onam Sadya feast. 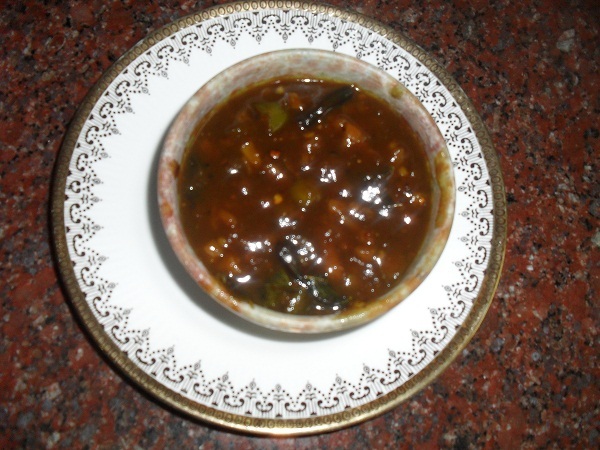 The flavour of this relish is enough to stimulate a good appetite.The spicy and tangy puli inji complements the sweetish coconutty taste of the rest of the vegetable dishes served during the feast. 1. 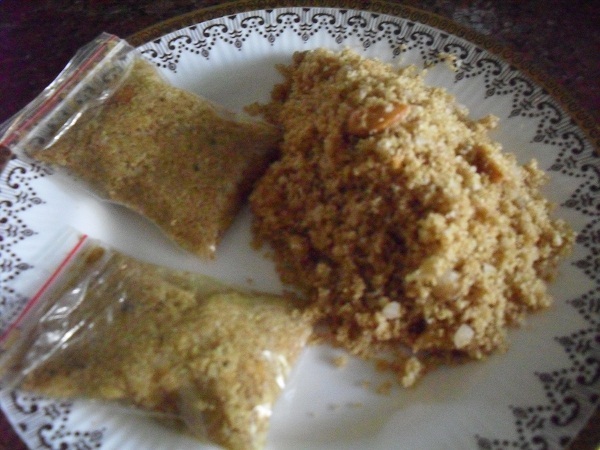 Dry roast asafoetida and fenugreek seeds till you get a pleasant aroma. Cool , powder and keep it aside. 4. When the mustard splutters add the broken red chillies and curry leaves followed by the chopped fresh ginger and green chillies. 5. Saute till the ginger is fried and add turmeric powder. 6. Pour in the tamarind juice. 7. Add jaggery and salt. One pinch of chilly powder can be added if desired, to enrich the colour. 8. Cook till the puli inji becomes thick and switch off when the oil starts to separate. 9. 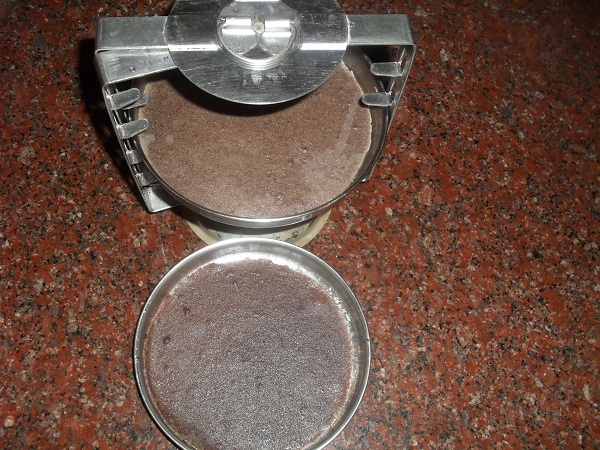 Blend in the dry roasted and powdered asafoetida and fenugreek seeds. Store in a clean dry container and relish the tongue tickling Puli Inji with your meal. Ona Sadya feast is held on the tenth day of the Thiruvonam festival celebrated with much grandeur in God's Own Country - Kerala. A festive spread of the special Kerala delicacies served on banana leaves includes at least eleven different vegetable preparations to go along with rice. While Upperis, pachadies, pickles and pappadams are served as side dishes, pradaman / paayasam and fruits satiate the desire for desserts.The lavish meal is also punctuated with a drink of warm shukku vallam ( water boiled with dry ginger powder ), and puli inji ( a ginger and tamarind sauce ) to help digest the great festive extravaganza. 1. Whip the curd smoothly adding turmeric powder,chilly powder, crushed pepper and curry leaves. 2. Gently cook the mixture, stirring now and then till it becomes slushy and reduces to one cup. 3. Stir in salt, switch off flame and keep it aside. 1. Grease your hands well before chopping the yam to avoid itching. 2. Remove the rough peel and cut the yam into one inch long and 1/4 inch thick slices. 3. Add a pinch of salt and a pinch of turmeric powder and cook with just enough water. 4. 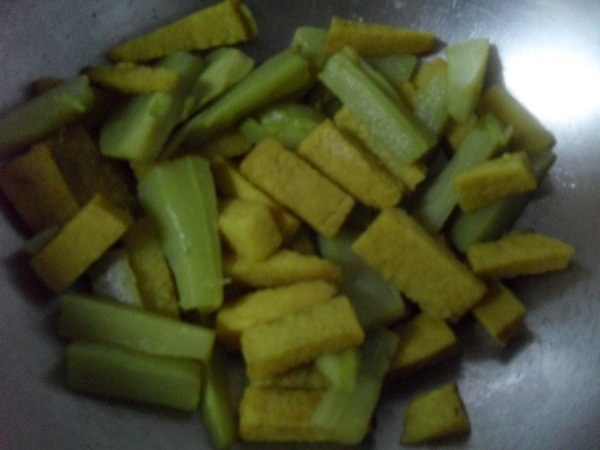 Peel the Chow chow/chayote and cut them into one inch long and 1/4 inch thick slices. 5. Cook with a pinch of salt and a pinch of turmeric powder. 1. 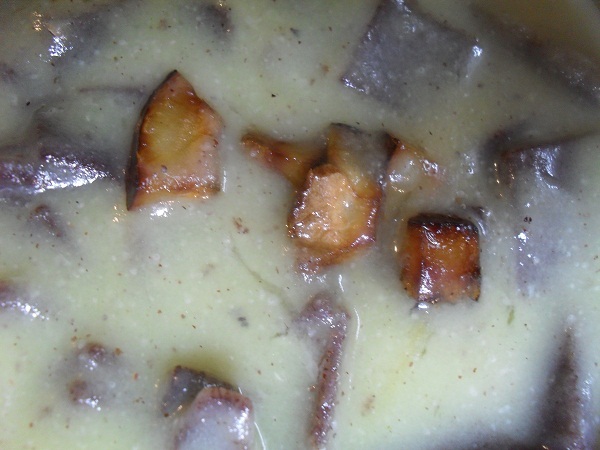 Combine both the cooked vegetables in a pan adding very little water if it is too dry. 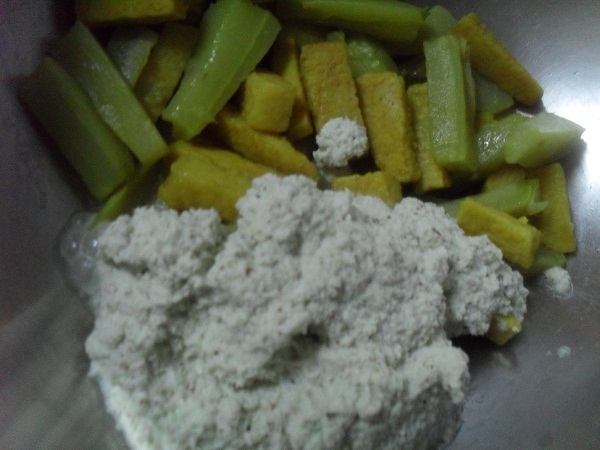 2.Add the coconut paste and cook for three minutes. 3. Add the spicy yoghurt cheese, stir well and immediately switch off flame. 4.Heat the oil and add mustard seeds. 5. When the mustard splutters add a few curry leaves and pour the seasoning on the thick kaalan. Enjoy the delicious kaalan with steaming hot rice topped with half a teaspoon of coconut oil.